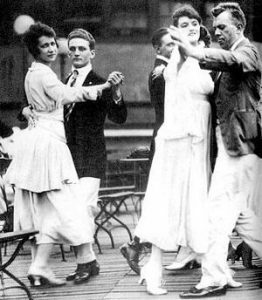 One thinks the dances of the 1990s to the present have been a bit outrageous but there was a time in the early 1910s when a whole series of dances spread across the nation. Some considered more scandalous than the dancing of the Roaring Twenties. 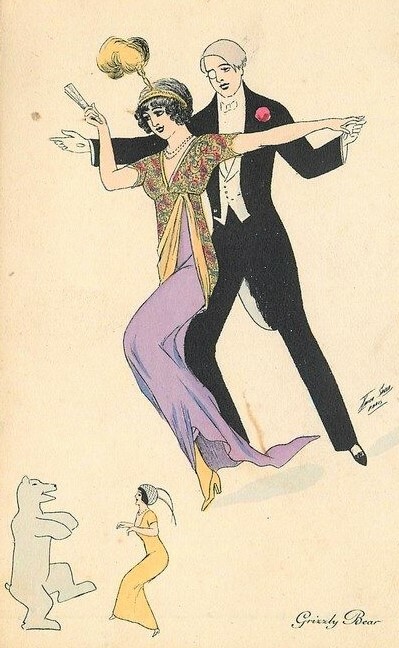 In the 1910s, a long-forgotten dance craze known as ‘animal dances’ were very popular. These dances embraced an entire menagerie of animals from land, sea, and air, often borrowing the creatures’ most distinctive moves. There was, for example, the grizzly bear, the camel walk, the horse trot, the crab step, the chicken flip, the kangaroo dip, and the bunny hug, to name just a few. 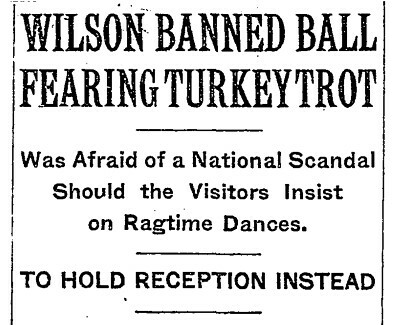 Yet, no dance was more popular or more controversial than the turkey trot. It was banned in multiple cities. 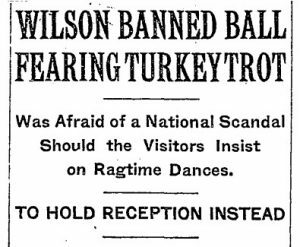 U. S. President Woodrow Wilson denounced the dance and would not allow it done at the White House, including not allowing an inaugural ball to be held for fear would dance the turkey trot. 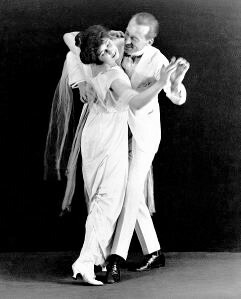 Later dances held at the White House while Wilson was president barred the turkey trot, along with the horse trot and the tango. Visitors to the East Room were instead supposed to content themselves with the more respectable waltz, minuet, and two-step. The ‘turkey trot’ had dancers take “four hopping steps sideways with the feet well apart, first on one leg, then the other. The dance was embellished with flicks of the feet and fast trotting actions with abrupt stops. Dancers were encouraged to also raise and lower their elbows while they danced to imitate the flapping wings of an excited turkey. It was considered by many dance experts as absolutely vulgar. There was Edward Bok, the powerful editor of The Ladies’ Home Journal, who discovered many of his female employees practicing it on their lunch break one day in 1912 and ordered them all fired. Bok’s action made headlines across the U.S. and soon earned him a merciless razzing in the nation’s press. By 1915 to 1916, with much of the world at war, people had other things to get worked up about and the turkey trot no longer seemed so scandalous. In succeeding years, animal dances fell out of fashion, with the exception of the foxtrot, which continued to be popular. See, your grandparents or great-grandparents may as young people danced those ‘animal dances’ and loved them. Who knew? Photos: Couples dancing the Turkey Trot, the grizzly bear, famous dancers of 1910s-Irene and Venon Castle and news article about Wilson not holding an inaugural ball.